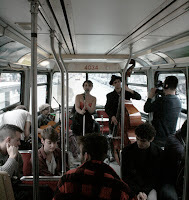 It was in late 2010 that our friend (and occasional little red contributor) Milan Schramek put together the Toronto Streetcar Sessions: a series of concerts held in the back of a TTC streetcar as it rattled and clanged around downtown Toronto. The shows were, of course, inspiring and unique and amazing in every way. And it was earlier this year that all the videos and the six free EPs that the sessions produced were released. They are easily one of our favourite things of the year, from the quiet folk awesomeness of Ivy Mairi, Donlands and Mortimer and Parks and Rec, to the all out gypsy punk of The Worldly Savages, to the jazzy Grim Preachers, to the fucked up violin virtuosity of Dr. Draw. We wrote about the Sessions a lot at the time, with a full post for each band, including downloads, videos, photos and more. You can read those starting here. Or you can head straight to the Toronto Streetcar Sessions website here. You'll find the rest of our "Stuff of 2011" posts here. If there's something you enjoyed this year that you'd like to share, write something about it and email it to us at submissions@littleredumbrella.com by December 21. We'll post some of our favourites. The Toronto Streetcar Sessions were chosen by Adam Bunch, the Editor-in-Chief of the Little Red Umbrella and the creator of the Toronto Dreams Project and was practiced by the entire staff. You can read his posts here, follow him on Twitter here, or email him at adam@littleredumbrella.com.